Home Business Intelligence How to create waterfall chart in Qlikview? 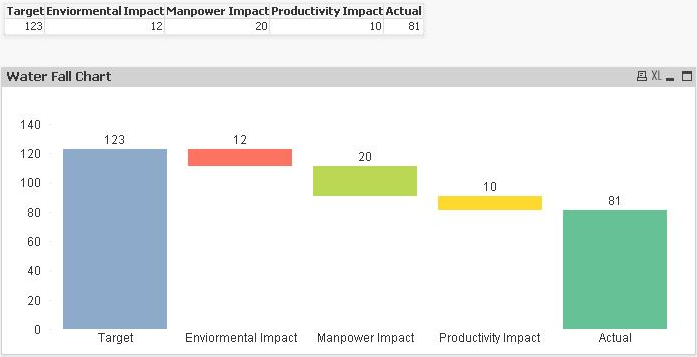 How to create waterfall chart in Qlikview? Typically, this kind of question helps business reflect on what worked well during the year and what did not, which then leads to next year’s plan and strategy. Typically, there is Variance due to multiple factors / reasons, as the businesses today continue to compete in an ever changing landscape. Unexpected regulatory changes, better than expected Sales during the festive season, are just a few examples of how things can vary from a plan. The waterfall chart is a one of the finest examples of data visualization. This indicates how an initial / reference value increases / decreases by various factors and reaches the outcome. Let us say, you expected Sales of $123 Mn in 2013, but you actually end up selling $81 Mn, a shortfall of 42 Crores. The obvious question from business is why is this difference? Overall productivity (efficiency) cost to 10. Compared to previous representations, this view is a lot more intuitive and provides all the necessary information in a single view. I started using waterfall charts in Excel ~ 5 years ago and have been in love with them since. So, when I started using Qlikview a couple of years back, I badly wanted this visualization in my dashboards. Unfortunately, this information was not available in any of the tutorials I had access to. Hence I thought to contribute this article for the benefit of other analysts like me who are struggling with similar question. 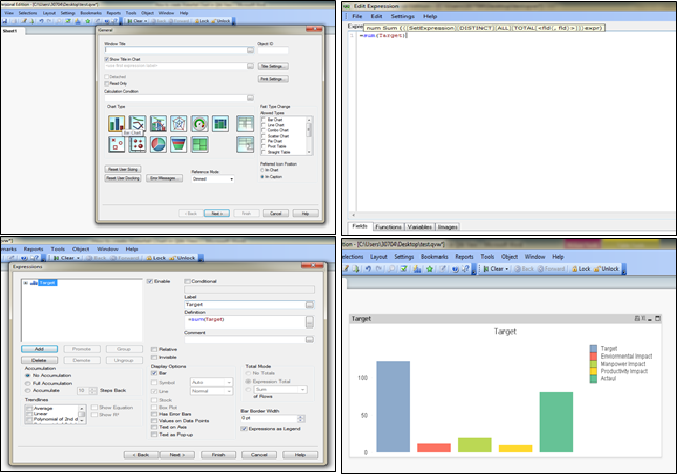 Let us go back to same example we started with and plot a waterfall chart in Qlikview. In Below representation, “Target” and “Actual” are initial and final value respectively. Now, we have chart like a normal bar which has a different bar for Target, Environment …. 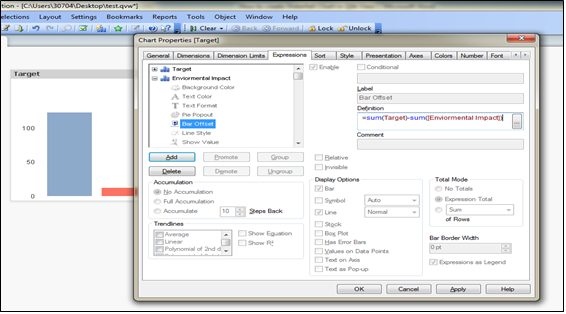 Right click on chart –> GoTo expression –> Click on ‘+’ sign of expression “Enviormental Impact” to expand properties of expression. Click on apply, Intermediate bars have moved above by equivalent cumulative differential value compare to target. 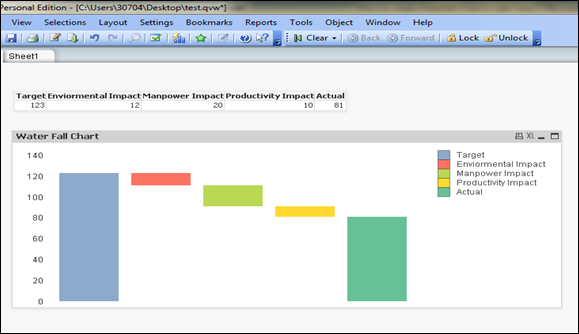 This is an example where we have brought out methods to create Waterfall chart in Qlikview. Do you use waterfall charts in your roles and visualizations? If yes, how do you create them? Do you think this tip is useful? Do let me know your thoughts on using this chart in Qlikview. Being paranoid about data accuracy! This post is very useful and thanks for spending your time in helping the other users. I have few more questions as a follow-up. I have a coulmn named type which is having 5 values “type1”, “type2″,”type3″,”type4″,”type5”. Please help me to get it done. 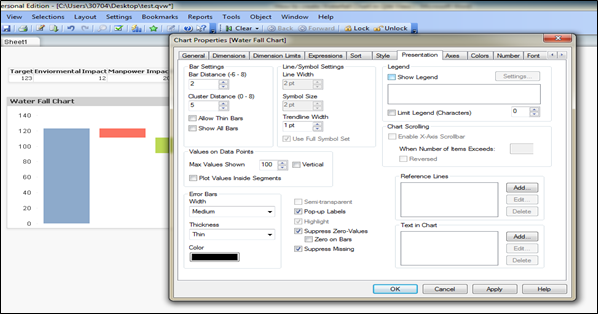 I have one dimension and three expression exp1, exp2 and exp3 in bar chart. I want to show fourth expression which will be on top of expr2 and the value will be difference of exp1 and exp2. Is it possible in qlikview. Very simple and good article. Really nice post.Its helps lot for a new learners.